When I first started to look into what I would need to create my own successful grow operation I didn’t think there would be too much to it. I was well aware that I would need some lights and some kind of appropriate structure for growing plants in, but I figured that was about it. As it turns out, that was just the beginning – there’s a lot more involved with growing plants indoors and if you don’t take the time to create the right environment for your plants you won’t have a lot of success. Indoor grow operations require several things to be successful including lighting, the appropriate amount of humidity, proper ventilation to ensure CO2 levels are maintained, a controlled temperature, and, of course, there are safety concerns to consider as well. If you put all of these things in place and use them in the right way there is no reason that you can’t grow plants indoors that are as healthy as outdoor plants. If you decide to use LED lights for your indoor grow operation as we recommend on this site, you can place the lights a lot closer to your plants without risking damaging them due to exposure to too much heat. 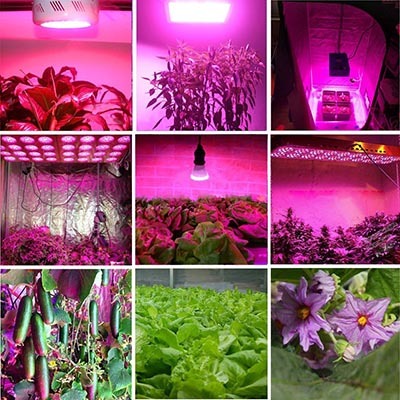 In general you can set LED lights no more than a couple of feet above your plants so that they can get the most amount of light in the optimum parts of the spectrum possible without too many concerns. This is normally done by hanging the light fixtures from wires attached to either the inside of your grow tent or from the roof of your greenhouse. If you’re using a grow tent it may also be a good idea to find one with reflective material on its walls and ceiling to enhance the amount of light your plants receive. You also need to ensure you use light fixtures that provide lights from all the essential parts of the spectrum from blue to red. In order for your plants to grow successfully indoors they need the right amount of humidity, which should be somewhere between 65% and 80%. If you allow the humidity to drop below 65% your plants won’t get enough moisture to sustain them properly and that moisture is essential in the photosynthesis process. If your indoor grow operation becomes too humid your plants won’t flower or bloom properly and you also risk the introduction of fungi which can harm your plants. Even if you get the humidity and lighting levels right it doesn’t guarantee that your operation will be a success if you don’t get the temperature right. Ideally you want to maintain the temperature in your indoor operation between 70° and 75°F – slight variations are okay, but you should monitor this carefully if you want the ideal crop yields. Artificial heating sources and/or air conditioning are important when attempting to control the environment of your indoor operation, so if you don’t already have access to these tools in your designated area you’ll have to consider a temperature control system as an essential expense and included it in your budget. Plants need CO2 just as much as we need oxygen – without it they won’t survive. The problem with an artificially created indoor grow operation is that you can easily find that you have insufficient levels of CO2 if you don’t control your environment. This means you have to set up a proper ventilation system which ensures fresh air is constantly pumped in from outside into your grow operation. This may be as simple as having an open window on one end and an open door on the other, or it can be as complicated as an intricately set up ventilation shaft system. Obviously the first option will be a lot cheaper. Another thing you need to consider when setting up an indoor growing operation is how safe your operation is. Traditional lighting systems used in grow operations can become quite hot and this requires extensive cooling equipment, to not only maintain temperatures that are conducive to plant growth but also ensure that you don’t set the place on fire. If you’ve ever touched a light bulb inside your favorite lamp you’ll know exactly how much heat I’m talking about – chances are you burned your fingers and you probably didn’t want to do it again. This is one of the main advantages of LED lights, along with the fact that they’re highly efficient. LED lights give off minimal heat and as a consequence are much safer than traditional lighting systems. If you have LED Christmas lights try plugging them in and then touch them after they’ve been plugged in for half an hour or so – you’ll probably barely notice any heat at all and that’s typical of LED lights. They don’t require expensive cooling equipment and so they’re much safer and cheaper in the long run than traditional lighting systems that have been used in grow operations in the past. There really is a lot to consider when you make the decision to begin your own grow operation, but if you do your homework and set it up properly it shouldn’t take you long to produce healthy and productive plants. As long as you set your lights up properly, ensure your plants are exposed to the right amount of humidity, maintain the right temperature, keep the CO2 levels up, and always consider safety first, there is no reason that your operation won’t be a success.